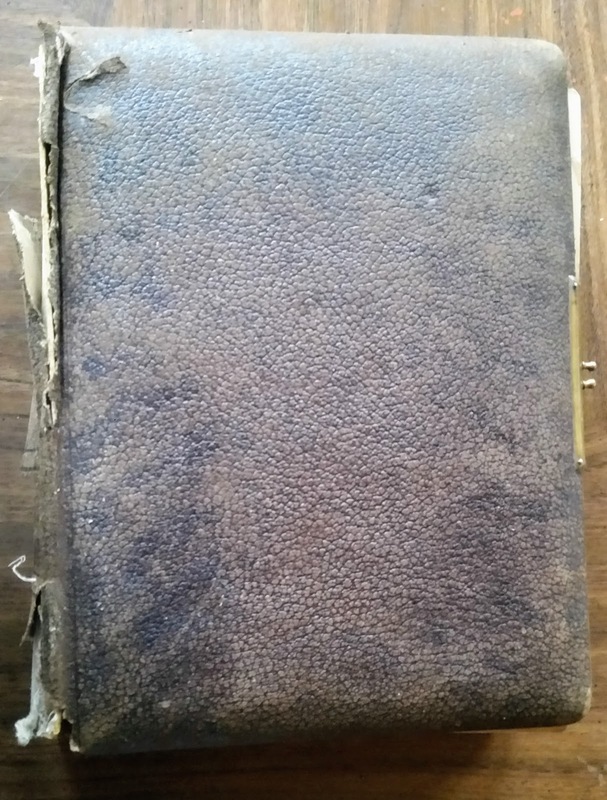 Photograph album, measuring approximately 11" by 8" by 2", that appears to be related to the Burneau, Matthews and Seymour families of Middlebury, Vermont, and Worcester, Massachusetts, and beyond. Note: this family may be related to the Burnor family of the Norwich, Vermont area, the subject of a photograph album featured in another post. Both surnames are reportedly variants of Bernard, a surname that goes back to 17th century Acadia. From identifications provided on the pages in which the photographs are inserted and on the reverse of some photographs, I'm guessing that the album originally belonged to Helena Mary (Burneau) Seymour, "Lena", and was passed on to one of her grandchildren. Hopefully, a reader with knowledge of these families or Vermont genealogy will weigh in. The name Lena appears on the reverse of several photographs, but I believe that in most cases her name was there to indicate that the photograph was to be given to her, not to indicate that she is the person in the photograph; i.e. her name appears on the reverse of a man's photograph. Cabinet photograph of three women, with the women in the middle identified as "Grand mother in the centre at age 14"; she may have been Helena Mary Burneau, "Lena". The photograph was taken by the Jackson studio of Middlebury, Vermont. 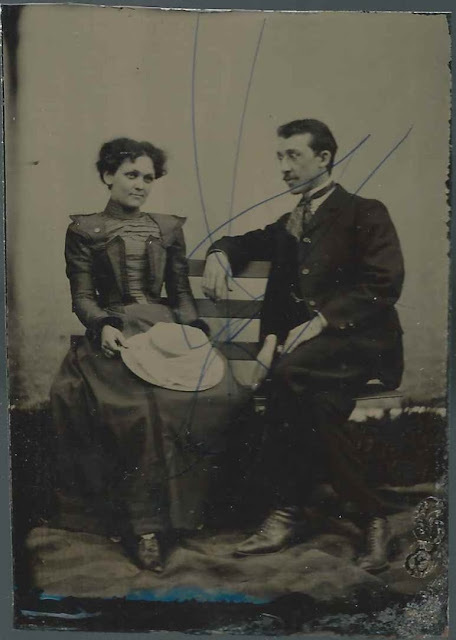 A tintype in the album is captioned: "Grand Mother & Grand Dad before marriage, Age 20 and 23"; presumably Helena Mary Burneau, "Lena", and Edward Peter Seymour. Helena Mary Burneau, "Lena", was about March 1878 in Vermont, the daughter of Peter Burneau and Mary Louise (Matthews) Burneau. About 1900, Lena married Edward Peter Seymour, son of Nelson Seymour and Catherine (Bowes) Seymour. According to a Vermont birth record, which appears to be in a modern hand and may reflect a misreading of an original date, "Eddie P. Seymour" was born June 8, 1875 at New Haven, Vermont. However, on his World War I Draft Registration Card, Edward gave his birth date as June 28, 1875. Lena and Edward lived in Vermont and then settled, apparently at some point after 1913, at Worcester, Massachusetts, though they may have lived briefly at New York City, where their son Bernard was born in the Bronx on May 27, 1901. Son Daniel J. Seymour was born in 1906 at Burlington, Vermont, and sons Leo James Seymour, Hubert Louis Seymour and John Francis Seymour were born at Middlebury, Vermont, in 1903, 1907 and 1913 respectively. Edward Peter Seymour worked as a printer and painter in the publishing industry. Edward P. Seymour's sister, Julia Frances Seymour, appears in two or perhaps 3 photographs, one of them when she was serving as a governess to the son of the U.S. Consul at Livorno (Leghorn), Italy. Julia, who was born about 1871, married George Albert McHugh back in Vermont in 1903, so her stint as a governess probably took place in a range from the 1890s to just after the turn of the century. During that time, the Consuls to Livorno were: Isaac R. Diller; James V. Long; Charles B. Davis; Edward C. Cramer and possibly as late as the term of Francis B. Keene. I'd dearly love to know more about Julia's adventure in Italy! The album contains many cabinet photographs, several Cartes de Visite and one tintype. If you have information on any of them, please leave a comment or contact me directly by the email address under Inquiries in the right margin. 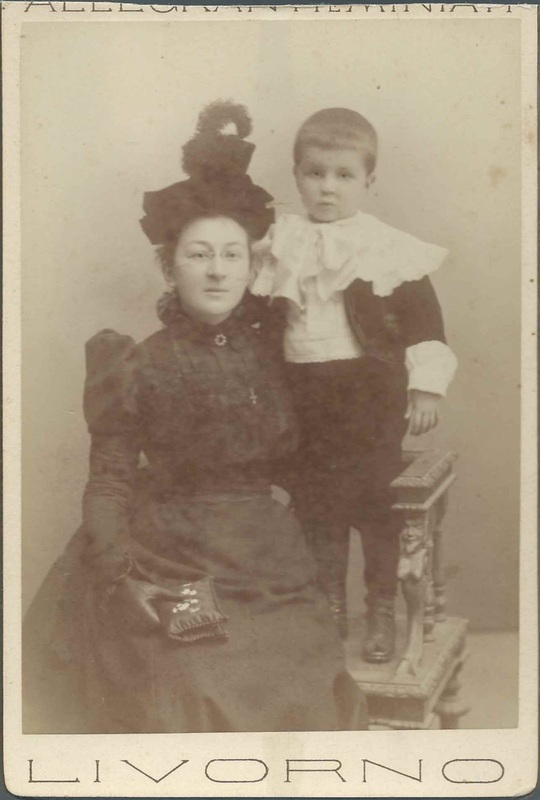 Cabinet photograph of a young boy and a young woman identified on the page containing the photograph as "Aunt Julia Seymour "Taken when she was in Italy as governess to the son of the U.S. Consul.". Julia was Julia Frances Seymour, born in 1870 in Vermont. She was the sister of Edward Peter Seymour, who married Helena Mary Burneau, "Lena", who may have been the original owner of the photograph album. Julia would marry George Alfred McHugh in 1903. The photograph was taken by a studio at Livorno, Italy. Cabinet photograph of a young woman; taken by the Jackson studio of Middlebury, Vermont. The name Lena appears on the reverse, as it does on many of the photographs in the album, even men and children. Consequently, it appears that some of the photographs were meant to be given to Lena and some, perhaps, were of Lena herself. Helena Mary Burneau was possibly the original owner of this photograph album, before and after her marriage to Edward Peter Seymour. Cabinet photograph of a young man; taken by the Jackson studio of Middlebury, Vermont. Written on the page below the photograph: "Grandmother's brother age 16 40 years ago." The name Lena appears on the reverse, along with: "1891" and "Geo". I believe the young man was George W. Burneau, born about 1874 in Vermont, and brother of Helena Mary (Burneau) Seymour, who was presumably the album owner. Cabinet photograph of an unidentified baby, captioned: "A fourth cousin (an Angel in Heaven)". The photograph was taken by the Jackson studio of Middlebury, Vermont. The name Lena appears on the reverse, presumably Helena Mary (Burneau) Seymour. 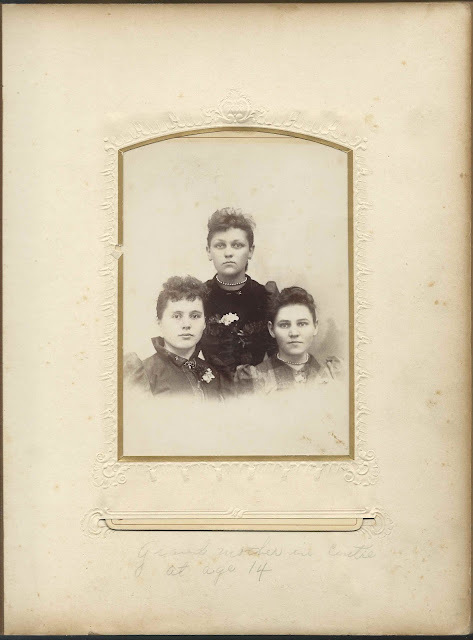 Cabinet photograph of three young women; taken by the Jackson studio of Middlebury, Vermont. Captioned on the page containing the photograph: "Grandmother in the centre at age 14". Written on the reverse of the photograph: "Lena 1892 14 years". This might be a case where "Lena" might refer to Lena herself, Helena Mary Burneau, future wife of Edward Peter Seymour and presumed owner of the album. Cabinet photograph of four young children identified on the page containing the photograph as "Second cousins 35 years ago." The photograph was taken by the Jackson studio of Middlebury, Vermont. The name Lena is written on the back, presumably referring to the fact that the photograph was directed to Helena Mary (Burneau) Seymour, presumed album owner. Cabinet photograph of four people, either a husband, wife and two children, or a father and three children; identified on the page containing the photograph as "Second and third cousins 35 years ago." The photograph was taken by the Jackson studio of Middlebury, Vermont. Cabinet photograph of a baby; by the Jackson studio of Middlebury, Vermont. Cabinet photograph of a young woman identified on the page containing the photograph as "Miss Daniels 35 years ago." The photograph was taken by the Jackson Studio of Middlebury, Vermont. Cabinet photograph of a young woman; no studio imprint. Bears a resemblance to Julia Frances Seymour, who appears in two other photographs in the album. Cabinet photograph of a baby identified on the page containing the photograph as "Daddy Age 9 months". Presumably one of the sons of Helena Mary (Burneau) Seymour and Edward Peter Seymour. Cabinet photograph of an unidentified young man; described as "Cousin" on the page containing the photograph. The photograph was taken by the Tibert studio of Worcester, Massachusetts. Lena had nephews named Crane, who lived at or near Worcester, Massachusetts; perhaps the young man was one of them: John Sherman Crane, Allan Raymond Crane or Grant Earl Crane. Their mother, Lena's sister, was Adella Lizzie (Burneau) Crane Kohler, whose first husband was Theron M. Crane. Cabinet photograph of an unidentified young woman; taken by the Hevy studio of 397 Main Street, Worcester, Massachusetts. Cabinet photograph of a woman identified on the page containing the photograph as "Great Aunt Della Kohler 30 years ago." The facing page contains a photograph of Della's second husband, Charles Kohler, mayor of Goshen, Indiana. Adella Lizzie Burneau, older sister of Helena Mary (Burneau) Seymour. Della had first been married to Theron M. Crane and had several children with him, but they apparently divorced. Cabinet photograph of a man identified on the page containing the photograph as "Great Uncle Charles Kohler when he was mayor of Goshen, Ind.". The photograph was taken by the William Parfitt studio of Goshen, Indiana. The facing page contains a photograph of Charles' second wife, Adella Lizzie (Burneau) Crane Kohler. More about Charles Kohler here. Cabinet photograph of an older man identified on the page containing the photograph as "Great Grand father". The photograph was taken by the Chickering studio of 21 West Street, Boston, Massachusetts. Was he perhaps Mr. Burneau, Mr. Matthews, Mr. Seymour or Mr. Bowes? Cabinet photograph of a young woman identified on the page containing the photograph as "Grandmother's Sister Rose 40 years ago.". The photograph was taken by the Notman Photo Company of 3 Park Street, Boston, Massachusetts. The name Lena appears on the reverse of the photograph. Rosalie Burneau was the older sister of Helena Mary (Burneau) Seymour, presumed owner of the album. Rose apparently never married. She died of stomach cancer in 1922 at Goshen, Indiana; her sister Adella Lizzie (Burneau) Crane Kohler was the informant on Rose's death record. Cabinet photograph of a young girl identified on the page containing the photograph as "Cousin Edith Nisun 35 years ago. "; taken by the Thibault studio of Burlington, Vermont. Edith Elizabeth Nisun was the daughter of Frank A. Nisun and Minnie E. Delphia, whose mother was a sister to Mary Louise (Matthews) Burneau, mother of presumed album owner Helena Mary (Burneau) Seymour, "Lena". Edith would marry William Patrick Casey. Cabinet photograph of two boys, identified on the page containing the photograph as "Cousins 45 years ago". The photograph was taken by the W. I. Rood studio of Spencer, Iowa. Cabinet photograph of two boys and a dog - the boys might be the same boys as noted in the previous photograph; identified as "Cousins" on the page containing the photograph, which was taken by the Medlar studio of Spencer, Iowa. Cabinet photograph of a young woman identified on the page containing the photograph as "3rd Cousin May Berringer. The photograph was taken by the William A. Webster studio of Waltham, Massachusetts. Cabinet photograph of a young man identified on the page containing the photograph as "Frank Barrows, 3rd Cousin 40 years ago.". The photograph was taken by the J. W. Brown studio of 187 Main Street, Norwich, Connecticut and Milford, Massachusetts [most likely the latter site]. Franklin Lewis Barrows was born in 1871 in Vermont, the son of Martin Nailor Barrows and Jennie Lenora (Matthews) Barrows, who was a sister to Mary Louise (Matthews) Burneau, mother of presumed album owner Helena Mary (Burneau) Seymour, "Lena". Cabinet photograph of an older man identified on the page containing the photograph as "Great Uncle Seymour". The photograph was taken by the A. W. Perkins studio of Claremont, New Hampshire. Presumably an uncle or brother of Julia Frances Seymour and Edward Peter Seymour, whose wife, Helena Mary (Burneau) Seymour, was the presumed album owner. If he was their father, that would mean that my presumption of ownership of the album by Helena Mary (Burneau) Seymour and then to one of her children would be in error. Written under an empty space where a cabinet photograph should have been: "Grandmother's Chum Catherine Daly. 40 years ago". Written under an empty space where a cabinet photograph should have been: "Miss Latan 35 years ago" Not sure of surname. Carte de Visite of a young woman in a very fancy hat, identified on the page containing the CDV: "Miss Halnan 35 years ago". The CDV was made at the Jackson studio of Middlebury, Vermont. Written under two empty spaces where there should have been Cartes de Visite or tintypes: "Grandmother Age 6" and "Grandmother Age 3"
Tintype of a young adult couple, identified on the page containing the tintype "Grand Mother & Grand Dad before marriage, Age 20 and 23". Assuming I have identified the album owner correctly as Helena Mary (Burneau) Seymour and one of her children, the couple in the tintype are presumably Helena Mary Burneau and Edward Peter Seymour. They were three years apart, so that test is passed. CDV of a young woman identified on the page containing the CDV as "Great Aunt Julia Seymour, 43 years ago". She was presumably the same Julia Seymour as in the photograph from Italy, where she was photographed while serving as a governess to the son of the U.S. Consul. She was the sister of Edward Peter Seymour, who married presumed album owner Helena Mary (Burneau) Seymour. CDV of an unidentified woman; on a page captioned "Friends 40 years ago." CDV of two unidentified young women; on a page captioned "Friends 40 years ago." CDV of two unidentified men; on a page captioned "Friends 40 years ago". CDV of an unidentified child; on a page captioned "Friends 40 years ago"